Review of a self-help book by Dr Chris Johnstone. I was at a wedding this summer and the groom said something brilliantly honest that stuck with me. He said that proposing to his girlfriend was the only real choice he had ever made in his life. I know what he means. For many of us, our lives just happen. We may think we are making choices but in fact we are following predictable paths through the social, cultural and economic webs around us. This book provides a detailed guide to creating change. Power in this case is not power over other people but power over our lives and our destinies. Sometimes the motivation for change may be dealing with problems like smoking. In other cases we may want to change because we realize we could do more with our lives. Whether the decision is to retrain, change job, take up a musical instrument or find love; this book is an excellent source of inspiration, guidance and support. A pervading myth of our liberal, individualist times is that we are independent sovereign entities living our lives how we choose to. This ideal surely ignores the reality of our evolved tribal mentalities. We are part of complex cultural networks. Largely, we do as those around us do. So who is steering the ship? This may be an adequate way to live if things are going well. The trouble is what happens when things go wrong? Chris broadens the scope to also include how individuals can find the power to respond effectively to global problems such as climate change. He expertly uses his wealth of knowledge in positive psychology and addictions therapy to show how we can move from denial to action. It has been said that the road to Auschwitz was paved with indifference. Is this what will also pave the road to run-away climate change? This important book helps us to see how we can become more then passive participants in the flow of life. By finding our power we can realize our potential as key players in the unfolding story of life on this planet and make a stand when it is needed most. In World War 2 our grand parents took a stand against a grave threat to our nation. For our generation the threat is greater and the whole planet is at risk. It is up to us to take a stand now. Find Your Power is an important book which can help us to do this. The good news it that by being responsive to the world around us, joining with others and taking action for a cause larger then ourselves we will live happier and more fulfilling lives. You can find out more about Dr Chris Johnstone here. 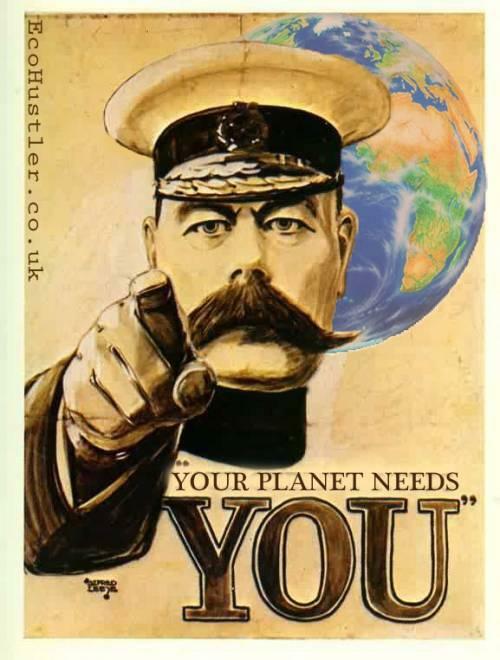 More Eco Propaganda Posters are here.